In Bhutan, the pursuit of Gross National Happiness (GNH) is defined as the government’s goal in the 2008 constitution. It is a central underpinning for all endeavours in social and economic development – including early childhood. The government has recently started to implement a parenting programme with the aim of reaching all parents by 2030. Driven by GNH, this programme encourages parents to look beyond managing behaviour, cognitive stimulation, health and nutrition. It has a strong emphasis on socio- emotional learning, culture, environment education and moral and spiritual development, and encourages parents to teach children values and skills such as environmental ethics, mindfulness, compassion and responsibility. In line with the GNH model’s focus on outcomes, it motivates parents with a long-term vision of what they would like their children to be like. In GNH, happiness is defined not just as individual gratification but includes communal harmony and peace (Thinley, 2005). Individual and collective happiness are seen as coming from a society that is fair, just and equitable, where we look after the environment, the source of all our wealth and resources; uphold the values on which our families and society were built, while respecting others that differ from our own; share the benefits of economic development and prosperity among all; and work with honesty, transparency, accountability and efficiency. Human qualities of self-discipline, empathy and compassion are desired. As such human qualities are largely shaped early in life, the need for proper care and stimulation of young children is recognised as fundamental. Parents have a huge role in laying the foundations of children’s behaviour, attitude and abilities (Al-Matalka, 2014). They can do this in many ways, including responsive care, providing a secure and stable environment, psychosocial stimulation, and acting as good models of positive social and emotional values (Desforges and Abouchaar, 2003). It is critical that parents understand how children develop and how best they can support this process. Not all parents are equipped with the knowledge and skills they need. Many children today grow up in high-rise apartments with little orientation to the natural and cultural worlds, almost no opportunities for outdoor play and socialisation, excessive unguided exposure to digital media, and little nourishment for the body or the mind; some have not even seen a book or a toy until they go to school (Gayleg, 2018). While poverty and socioeconomic factors are dominant causes of these issues, they can also be attributed to reduced opportunities for parents to be with their children, and lack of understanding of how to support and care for their children so that they grow up to be healthy, happy and caring human beings. 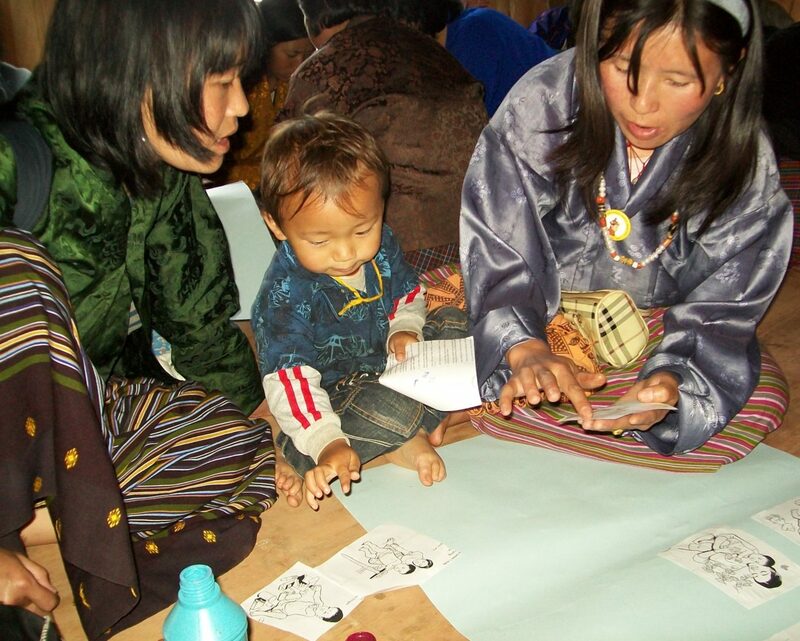 With the help of UNICEF, the government of Bhutan has developed an early childhood parenting model with a thematic approach that aspires to address the health, learning and protection needs of young children, encapsulated in a child well-being framework. The curriculum seeks to equip parents with skills to effectively support children’s development, blending modern best practices and cultural practices that support of children’s development. It recognises the role of parents in improving the well-being and developmental outcomes of children and their role in improving communities and workplaces as they grow up. The parenting programme integrates child development outcomes and GNH ideals in three themes – seeking to ensure that all children are strong and healthy; smart and happy; and safe and protected. Over 16 sessions grouped into four stages, parents engage in dialogue that enables them to share their experiences and support each other, prioritising social and education equity, active participation of fathers in parenting, and inclusion. The first stage provides parents with the opportunity to discuss their views about what children need to be healthy, smart and safe, identifying practical challenges to well-being and discussing how these challenges could be overcome. The second stage enables parents to reflect on the importance of teaching cultural, moral and spiritual values to young children and relating these to their current parenting practices, encouraging them to share what they do and why. The process helps parents to understand the practices of others within the community and to share them with their family members and try at home. The third stage enables parents to learn how to assess child development milestones using pictorial child development tools to help them understand, observe, assess and support their own children. Parents are encouraged to develop homemade low-cost toys to stimulate their children at different ages and stages, observe their developmental progression and track it using cards. In the process, they also learn how to identify and support children with developmental delays and disabilities, reaching out to each other and building support networks for a group approach to parenting. The fourth stage helps parents to reflect on their experience in the parenting education programme and to see how they have improved in both their understanding of the child well-being framework and their own parenting practices at home. The idea is also to help them collaborate and help each other in parenting young children, thereby establishing a network for mutual support and sustaining the effort to educate all to be good and happy parents. The model recognises that while increasing the awareness and skills of parents can address many issues, parents are not able to solve all problems on their own. The African saying ‘it takes a village to raise a child’ has never been more true: communities, policymakers and civil society need to work together for children’s development. "‘The model recognises that while increasing the awareness and skills of parents can address many issues, parents are not able to solve all problems on their own.’"
The parenting programme is delivered through government-supported preschools in villages. It takes about a year to complete. The programme is delivered by facilitators who are appointed and paid by the government and trained, with the support of UNICEF, to run both the preschool programme and the parenting programme. The facilitators are assisted by village health and agriculture workers and the village school principal. On average, groups of about 15 parents at a time participate in the sessions, often with a mix of children from birth to age 8: parents of older children can share their experiences with parents of younger children, and discuss parenting issues and how they could be overcome. The programme is compulsory for all parents who have children in the government-supported community preschool – and, as the government- supported preschools are popular, many parents of under-3s are motivated to attend the programme by the prospect of their children being able to attend the preschool. Initially one member of each family attends, and eventually every member gets the opportunity. Any other parent can also choose to enrol, and all are encouraged to do so – although without an incentive such as a preschool place, it is a challenge to persuade parents to attend, as many work full time and are tired in the evenings. The community early childhood centres to which the preschools are attached currently cover 21.8% of children aged 3–5, and the ambition is to scale-up their coverage along with the parenting programme. 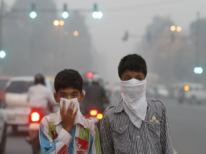 The goal is to achieve 50% coverage by 2024, and universal access by 2030. In future, as the parenting programme expands, it could also be delivered through other platforms such as health services, primary schools and non-formal education programmes. While targeted at parents in rural areas and poor urban districts, as they are the most vulnerable groups, the parenting programme would be beneficial for all kinds of parents including working parents, illiterate parents, and parents from low socioeconomic backgrounds. As the programme is just beginning to be implemented, no evaluations have so far been conducted. Its effectiveness will ultimately be measured by improvements in child well-being through improved parenting practices associated with positive developmental outcomes and increased actions in the community to improve early learning, parenting and child services. For now, it is believed that this parenting education model will contribute not just to improving parenting practices by blending child development science and Gross National Happiness principles, but also to building harmonious communities that support each other in raising children who are strong, healthy, happy and caring.